Using small and large group discussions, activities, role plays and debriefs. Supporting material to back up learning. All participants to get material on State of Mind and Active Listening and the principles of cooperative conflict resolution. No slides – learning by doing. What is conflict resolution? Different approaches to this – focus on the models more appropriate to cooperatives – facilitative styles; person and group focussed. States of mind – exercises to build internal understanding of being non-judgemental, consensually focussed, solution focussed, unbiased, people/work orientated. 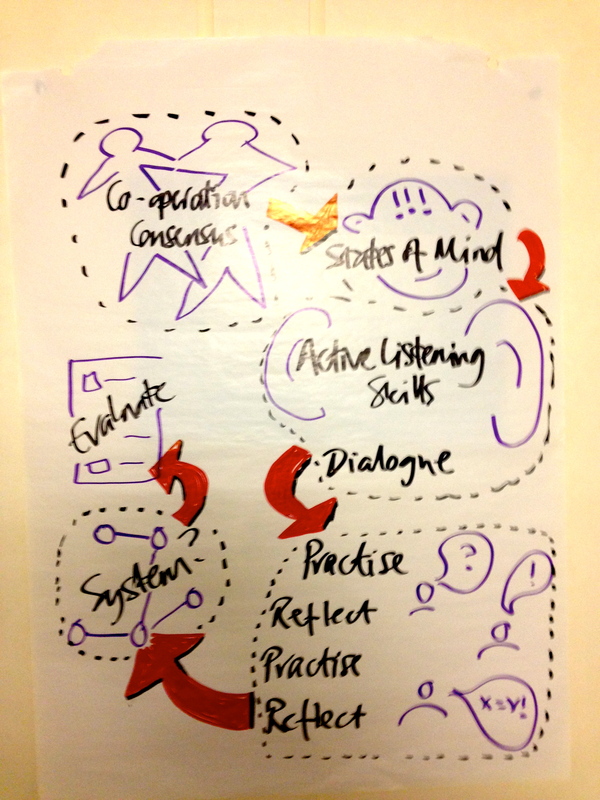 Active Listening – listen, reflect, clarify, summarise, explore, produce ways forward, agree on them, action them. Go through these phases and make explicit why different to everyday conversations. Practise sessions – rounds of work on threes or fours with peer to peer work and peer observers giving feedback, along with the trainers (if needed), on realistic role plays. Review sessions – check ins on understanding of material and its application. Co-designing a process to deal with small scale conflicts and knowing when to refer them to personnel. All of the handouts we used, are available on our resources pages. Use and share.